We’ve been having rain, rain, rain, all week. And more forecasted all next week. I think we had about 25 days in August that were rain-free, including an extended stretch of over three weeks. Before, and now also apparently after, that brief window, it’s been rain. I saw a Facebook friend describe it as an extra-long spring, and an early fall, with no real summer. So true. All this rain has been great for mushrooms, though, among other things. I saw SO many mushrooms while out walking with Raven this afternoon (I made sure to check the radar before grabbing my camera and heading out – I had about an hour before more rain arrived). I took photos of a bunch of them, which may show up in a separate post later this week (I have subjects planned already for Saturday, Sunday and Monday, and hope to actually post all three days, but we’ll see how it goes). But I thought I’d share these photos separately. I did a big loop about the property this afternoon, sticking to the wooded areas, mostly. I returned to the house by way of a pine plantation at the foot of the property, along the road, that the owners had planted a couple of decades ago as a privacy screen when a couple of houses were built across the road from them (the same spot where I’d found the Pinesap a couple months ago). They are very plantation-y, straight rows, little-to-no understory. But they do their job well – even though the house across the road is only about 150 m (165 yards) from our own, and there’s about 70 m of meadow on that side of our house, we can’t see it. Because the pines are fairly dense, and not much grows there, I’ve only been into them once or twice, shortly after we moved here. Inevitably I come out with my hair full of twigs and needles. There are as many as 50 or 60 species of mushrooms that will regularly grow in fairy rings, but I’m fairly certain that this one is Gymnopus dryophilus. Its scientific name, dryophilus, means “lover of oaks”, and it is usually referred to by the common name “Oak Collybia” or “Oak-loving Collybia” (Collybia being the genus it used to be assigned to, before the genus was split into three; members of the daughter genera still go by the common names Collybia, though). Despite this, it is actually found associated with a range of tree species besides oak, pine being one of the primary ones. It’s one of the most common of forest mushrooms, found in many habitats, across much of the continent, fruiting for most of the year, and I’ve noticed on a few websites that it’s been (jokingly) given the label “weed mushroom”. It happens to be edible, but apparently it’s fairly tasteless, and the stalk is fibrous – it’s also known by the common name “Russet Toughshank”. The most common fairy ring mushroom is a species actually called the Fairy Ring Mushroom, or sometimes Scotch Bonnet, Marasmius oreades. It’s most often encountered in the middle of grassy lawns, and is also edible, and (I gather) quite tasty. As I understand it, fairy rings are the result of a colonizing spore spreading out mycelium (mushroom “roots”) and then popping up fruiting bodies at the furthest edge of the mycelium. Because it uses up nutrients from the soil as it grows, the mushrooms only appear at the outside edge, where the nutrient availability is greatest. As the mycelium network gets wider, so does the ring of mushrooms. The strange formation unsurprisingly resulted in quite a bit of superstition; the most commonly known (and the one that gives the rings their common name today) is the Celtic belief that the rings were used by fairies for dancing. 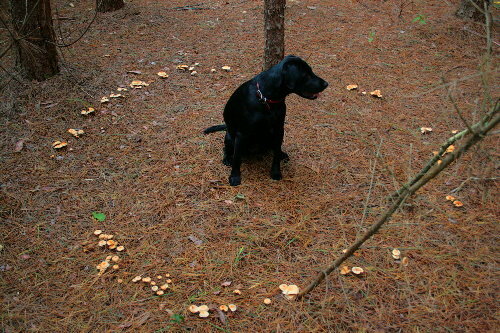 There are two types of fairy rings: free and tethered. 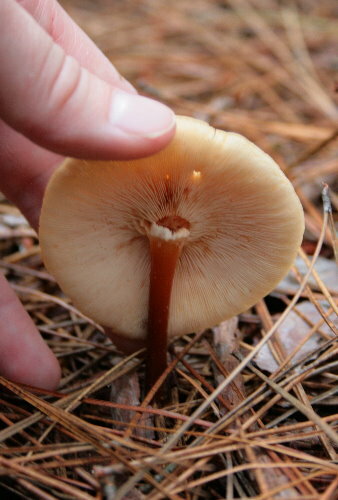 Tethered rings are the result of mychorrizal fungi that depend on a host tree for survival (and the host tree also benefits from them). They are usually found around a central tree trunk and never get very large. I think this ring is one of those types, because of the trunk in the centre that Raven is sitting beside, although it could just be coincidence. 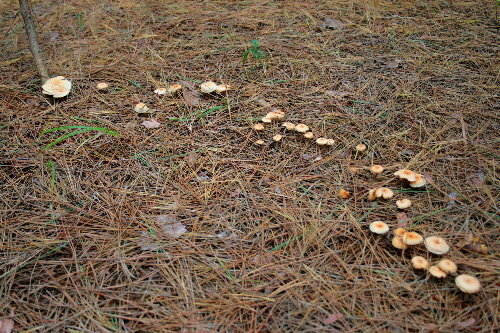 Free fairy rings aren’t associated with trees and so aren’t restricted in where they grow or how large they get. In theory they can continue growing indefinitely. The biggest known ring, of Clitocybe geotropa and found in France, is about 600 m (655 yards) in diameter, and estimated to be about 700 years old. I love the new blogskin (well, I’ve been away quite a bit and it is new since I was here last). The Peru site looks amazing! I love your photo of your faerie furry friend, King of the Ring, Raven! “Inevitably I come out with my hair full of twigs and needles.” I had to laugh at that. Ah, the price we pay to enjoy nature. This was very informative–and I love the photo of Raven in the middle of the ring. While I’ve seen these formations a few times, I’d never bothered too much with investigating them because they always seemed associated with the ‘drip line’ beneath trees. That’ll teach me to assume! I dont disagree with this blog!! !